The comparison with the official 2014 Star Destroyer in the foreground shows how awesome and big this custom ship really is. Doomhandle’s ISD Tyrant is so massive, he was able to fit a hangar bay, multiple ships, and three levels of various rooms inside. The Tyrant is over 56 inches (1.4m) long and weighs approximately 70 lbs (32kg) with a full load (the interior adds a lot of weight). 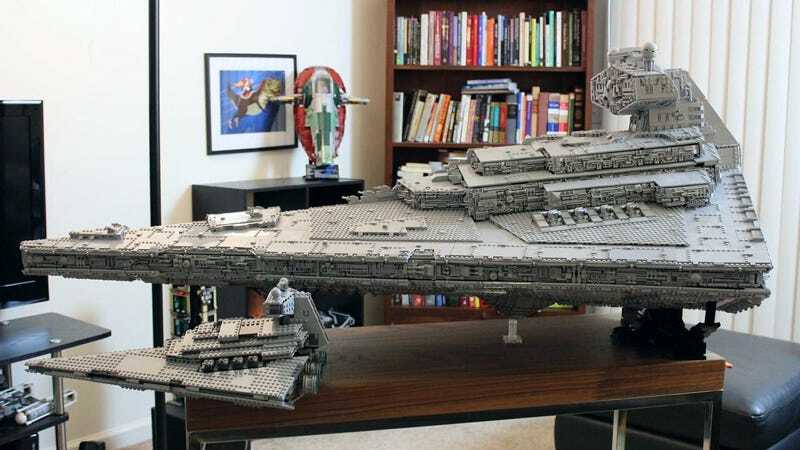 That makes it about 20 inches longer — and quite a few times heavier — than the classic LEGO UCS version. So it’s not just a gigantic MOC, but has awesome features inside, around twenty times the size of the official set. That’s the outside from all angles. And here’s the top level with the command bridge, the captain’s cabin, a conference room and a Sith meditation chamber below. That’s pretty cool. Level two below has even more stuff, with a classic Imperial walkway, sensor and gunner stations, a medical bay, a turbolift and engineering stations. And below all lies level one, the largest section of the three. This level has a barracks, a cargo hold with a detention center, and a pretty damn cool hangar bay with some TIE Interceptors, a Sentinel Class Shuttle and a captured Rebel fighter. Incredible build! Be sure to check out Doomhandle’s gallery for even more pics, zoom-ins and a showcase of the minifigs.